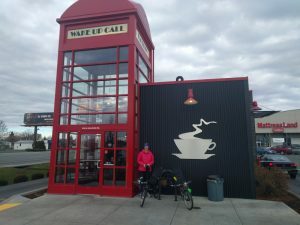 Today we took our sixth “coffeeneuring” ride (see the post on our first ride for more information). Our previous ride was almost two weeks ago: Zach went to his third board gaming convention of the year, and we also got our first good snow, so we’ve been cross-country skiing instead of cycling. But it got warmer again in the mountains (and down here), and we got back on the bikes. We decided to ride to the Wake Up Call at 210 N. Sullivan Road in Spokane Valley, WA. It was a fairly pleasant ride, half on the Centennial Trail, and much of the rest on designated bike routes on streets. It was about a 16 mile round trip, somewhat breezy and in the low 40’s. 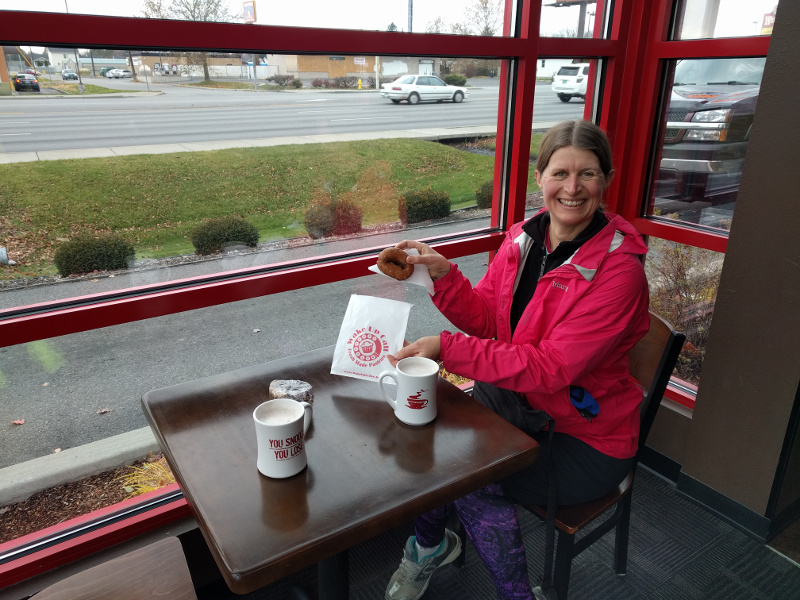 The official coffeeneuring challenge calls for 7 rides before November 19… the weather is not looking good the rest of this week though, so we may not finish the challenge. Stay tuned!